1. 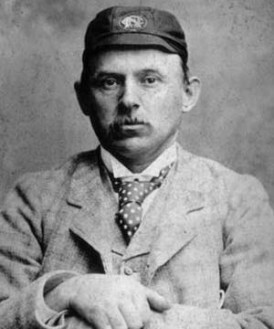 Arthur Shrewsbury (1856-1903): Captained England in seven of his 23 Tests in which he scored three centuries with a highest score of 164. Considered the best batsman in the world at his peak. Shot himself. 2. Albert Trott (1873-1914): Prominent all-rounder of the 19th century who played five Test matches, first for Australia and then for England. Shot himself. 3. Andrew Stoddart (1863-1915): Captain of England and also a prominent rugby player in the 1890s, he played 16 Test matches and scored two centuries. Shot himself. 4. Billy Zulch (1886-1924): For some years, the leading batsman in South Africa, he played in 16 Tests with a highest score of 150. Died by cutting his throat. 5. Aubrey Faulkner (1881-1930): One of the best all-rounders of his time, he played 25 Tests for South Africa between 1906 and 1924 scoring 1,754 runs and taking 82 wickets with his legbreaks. A legendary coach, he gassed himself at his cricket school in London. 5. Jack Iverson (1915-1973): Known as the ‘mystery bowler’ due to his unique grip, the legbreak bowler played in just one series for Australia at home against England in 1950-51 in which he took 21 wickets in five Tests. Shot himself. 6. Sid Barnes (1916-1973): A contemporary of Don Bradman, he scored three centuries in just 13 Tests for Australia with a top score of 234 at the remarkable average of 63.05. A controversial character, he took an overdose of sleeping pills. 7. Harold Gimblett (1914-1978): Dashing batsman who smashed 123 runs in just 65 minutes on his county debut, he also scored 67 not out on Test debut against India at Lord’s in 1936 though he played in only three Test matches. Died after taking an overdose of sleeping pills. 8. Jim Burke (1930-1979): A century on debut for Australia against England at age 20 promised much. Only two more followed in a total of 24 Test matches but he earned a name for himself with his dour batting. Shot himself. 9. Noel Harford (1930-1981): The New Zealand middle order batsman toured Pakistan and India in 1955-56, scoring 93 and 64 on debut at Lahore. But he found little success after that and played just eight Tests. He killed himself by inhaling carbon monoxide fumes. 10. David Bairstow (1951-1998): Though he played only four Tests and 21 ODIs as a wicket-keeper, he was a popular player for both England and Yorkshire and scored 59 on his Test debut against India in 1979. His son Jonny made his ODI debut against India earlier this year. Hanged himself. Acknowledgement: Silence of the Heart: Cricket Suicides by David Frith.